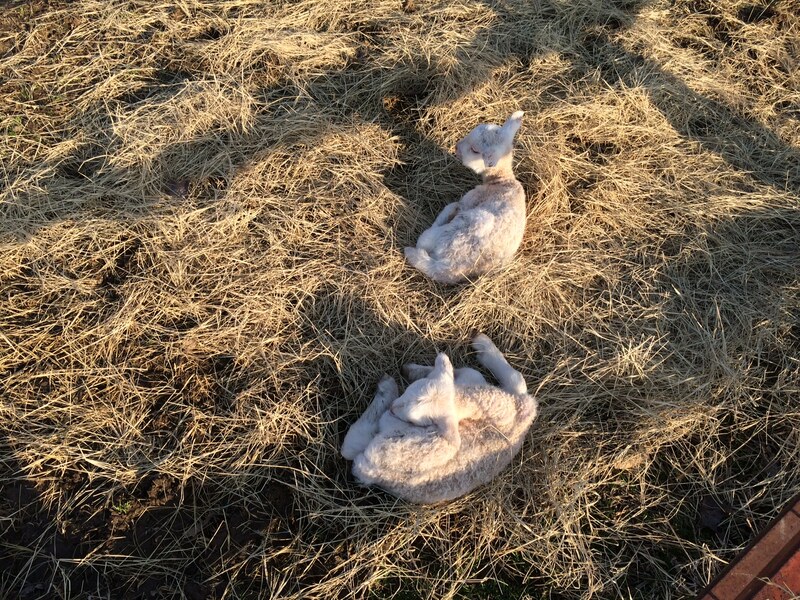 Early March in Mississippi after long, cold winter. Julie and I saw our bees flying on warm days this winter, so we knew that our two hives had survived the polar vortex, but we weren’t sure how much honey remained by February. It was still too cold to inspect the hive, and I didn’t trust my ability to judge honey stores by testing the weight of the supers. Hives can starve to death in early spring if they run out of honey before the spring bloom begins so we started feeding them sugar water in mid-February with Boardman feeders just in case. 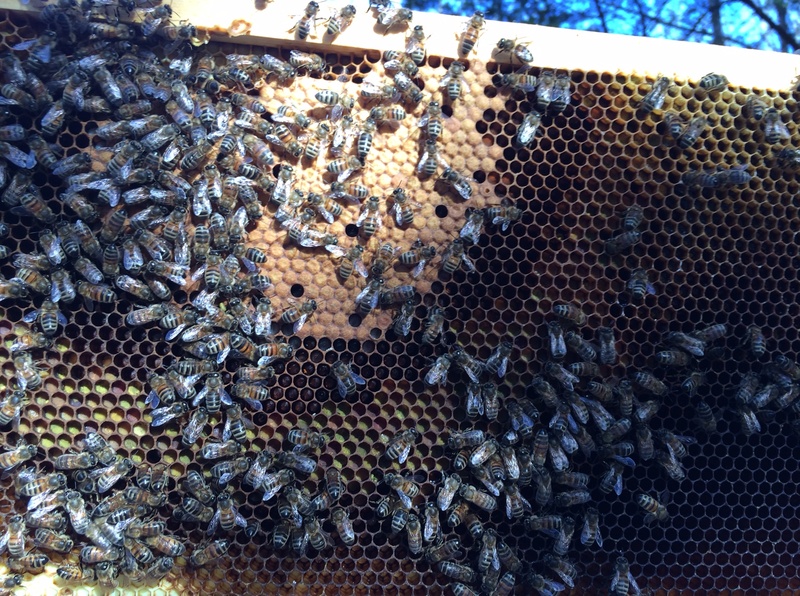 We conducted our first spring hive inspection this week, and I was thrilled to see that both of our hives had frames like the one above filled with eggs, larvae, capped brood, pollen, and honey. The close-up below shows the yellow pollen, which is the protein in “brood food,” or the nourishment fed to developing bee larvae. The shiny liquid is nectar, or more likely the sugar water we fed in February, which is the carbohydrate in brood food. 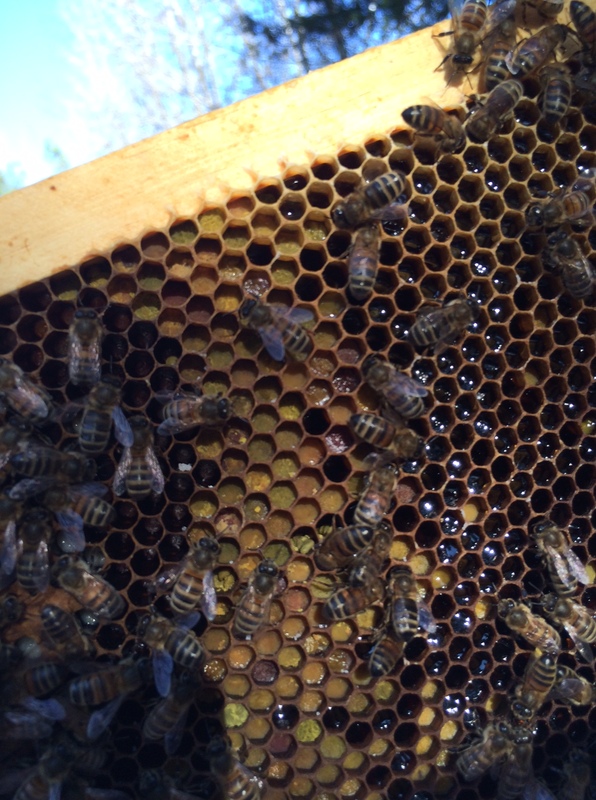 When you see a lot of pollen in your hive in the spring, it means the queen is laying eggs to grow her population of workers. I think our bees survived the long winter because we 1) didn’t rob any honey last year and 2) fed them sugar water in the fall. They kept themselves warm by cozying up together in a basketball-sized cluster, and they ate honey (made from pollen and nectar or sugar water) they gathered last year. Julie also left dry sugar for her bees which they could eat over the winter as an emergency ration. As a result, her bees were less needy this spring and didn’t eat the sugar water as fast as mine did in February. Since our hives are not in danger of starving we will stop feeding and soon add empty supers for them to expand their population and, if we’re lucky, fill with honey.